How to: Roll about 18 pieces of patterned paper into tubes. I used all papers from the Chap collection by American Crafts. Cut a heart from scrap cardstock, cover it with strong adhesive, place the paper tubes down the front, and trim the excess. Wrap mint green ribbon across the top and add a blue banner sticker on the right side. Back a gray chipboard frame with white cardstock and place yellow "i" and "u" foam letter stickers inside. Cut a heart from a red patterned paper tag and set it between the letters using a pop dot. Adhere the frame over the banner sticker. Tie a bow from more of the ribbon and place it below the right side of the frame. 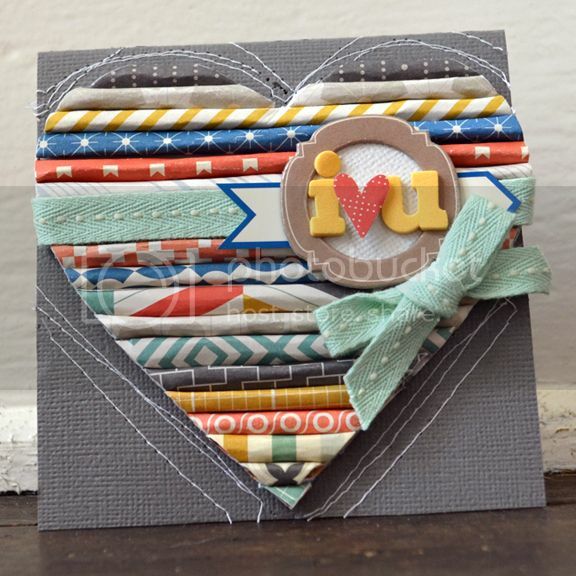 Set the rolled paper heart on a square dark gray cardstock base and trace around it with a pencil. Remove the heart then sew three borders using white thread around the heart. Glue the rolled paper heart to the middle and you're done! How to: Punch (19) 1" squares from assorted patterned papers then fold two opposite corners of each square to the middle. Adhere the shapes side-by-side in a row of 6, 7, and 6 on the front of a robin's egg blue cardstock base. Straight stich across the middle of each row using white thread. Add various buttons to the front as shown. Draw a border around a chipboard banner using a black pen then place yellow mini alphabet stickers on top to make a sentiment; adhere the banner with pop dots to the bottom right side of the card. How to: Handcut lots of hearts of various sizes from coordinating patterned papers. I used the Peachy Keen line from American Crafts. 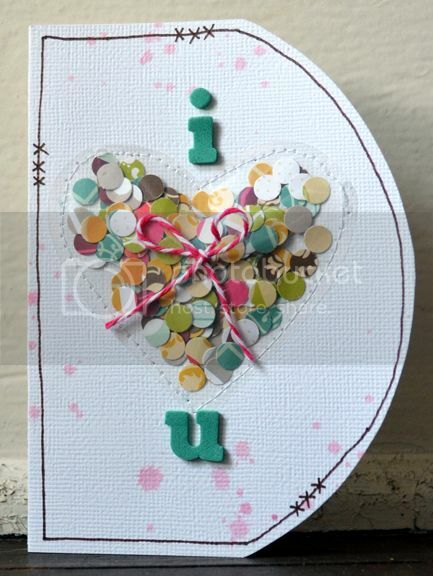 Layer concentric hearts then adhere them in a circle on the front of a square yellow cardstock base. Sew three circles over the hearts using white thread. Place a pink sentiment badge in the middle. Pierce two stickpins (one pink pearl and one jewel) into the foam adhesive behind the badge then knot gray baker's twine in a bow around the base of the stickpins. How to: Make a card base from white cardstock then trace around a small round plate on the right side and trim to make a curved edge. Trace around the card edges using a brown pen and add three set of three 'x's as shown for detail. Three-hole punch a bunch of patterned papers (I used the Garden Cafe line from American Crafts) to make confetti. (I love the confetti trend these days!) Trim a heart from a transparency then place a tiny bit of adhesive on the edges before placing it in the middle of the card. Start sewing around the edges of the heart, fill the heart with the confetti, then finish sewing around the heart. Glue a pink baker's twine bow on top of the heart. Place an aqua "i" foam letter sticker above and "u" below the heart to finish. How to: Trim lots of small pieces of various ribbons, fold each piece in half, and secure with adhesive. 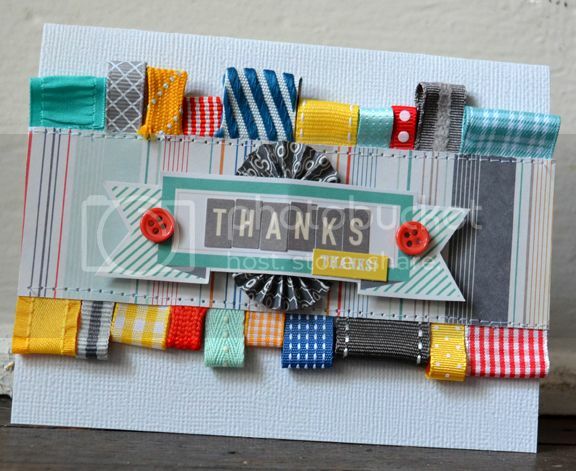 Glue the ribbon tabs across the top and bottom of a light gray cardstock base. Add a multicolored striped paper block across the middle then sew across the top and bottom edges of it to secure it and the ribbons in place. Cut a gray accordion paper flower in half and glue them to the middle with a gap between. Cut out a banner from a journaling card, add a red button to either side, then place gray mini alphabet stickers and a yellow sentiment sticker on top; adhere the banner to the middle of the card. Until the next batch, TTFN, ta-ta for now! WOW!!! This post is full of inspiring creations Paige. love them. I love each and every one of them! Just a brilliant mix of patterns and colors! Thanks SO much for the eye candy, Paige! I love love your choice of challenges (as always!)! Your take on the challenge is oh-so inspiring! are these! so talented ..
by the way love ..
are you familiar with SOPA & PIPA? wow, you just amaze me. I can't believe all the ideas you come up with paper. So awesome. I so want that rolled paper heart card. love. seriously!!! I always LOVE to see your cards!!! sooo much eye candy going on!!! you are so creative, love every single card!! great job with those challenges, paige. i'm about to go check out the blog to see those challenges myself. Oh my Gosh - I love those cards. I tried to pick a favorite so I could rave about it here for you....but it was too hard! I seriously loved them all. What a great job you did on all these cards!! They are so cute, fun and well made! I love all the ideas, Super cute! Wow, these cards are amazing!! You made all of these in one day? WOW! You always have something beautiful up your sleeves! I wish I had more time to scrap and craft right now!! All of these cards are fantastic! 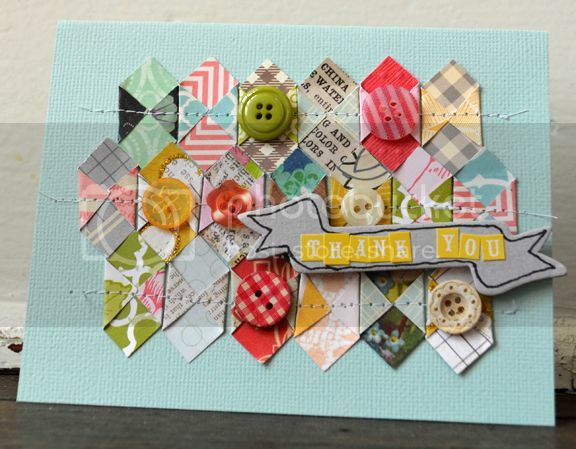 I am convinced you are the patchwork diva! I just love your signature style Paige! These cards are so creative! I love the dimension of them all, and that last card is my favorite! I love every.single.one....they are all amazing. You are so ridiculously talented. I can not tell you how inspired you have left me today!!!!!!!!!!! These look sooo amazing! Totally inspired by you! These are ALL so fabulous and unique and happy and full of sunshine! TFS, Paige! WOW! These ALL are packed with awesome!!! Love them! What an inspiration you are with your style! I just adore your style, Paige! Love the original designs and the colors and textures are amazing! Thanks for the wonderful inspiration! Beautiful, these are all just beautiful! Paige, these are all so inspiring! I see every little detail in each one as a work of art. LOVE. Wow...these are all stunning....saw you hearts one on the Create blog....beautiful! !